Be the first to share your favorite memory, photo or story of Lafeyette. This memorial page is dedicated for family, friends and future generations to celebrate the life of their loved one. 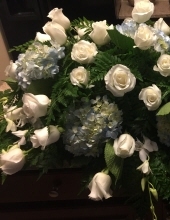 AIKEN - Mr. Lafayette Trowell, 63, of 1211 Hatchaway Bridge Rd, husband of Inez Trowell entered into eternal rest Saturday, December 1, 2018 at his residence. He was the owner and operator of Trowell's TV & Repairs of Aiken. Funeral arrangements to be announced at a later date. Friends may call the residence or JACKSON-BROOKS FUNERAL HOME, 126 Fairfield Street SE., Aiken, SC 29801 @803-649-6123. To send flowers or a remembrance gift to the family of Lafeyette Trowell, please visit our Tribute Store. "Email Address" would like to share the life celebration of Lafeyette Trowell. Click on the "link" to go to share a favorite memory or leave a condolence message for the family.